US, 2001, 110 minutes, Colour. Jennifer Lopez, Jim Caviezel, Terrence Howard, Sonia Braga, Shirley Knight, Jeremy Sisto, Victor Argo. 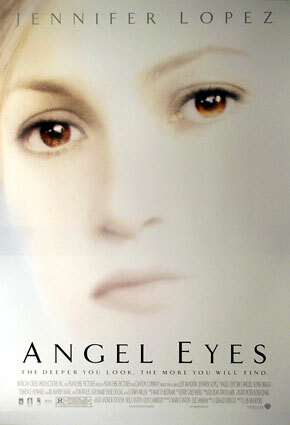 Angel Eyes is a police thriller from the director Luis Mandoki, who made such films as White Palace, Message in a Bottle, Born Yesterday, When a Man Loves a Woman. This means it is a competently and stylishly-made popular entertainment. The film is different insofar as Jennifer Lopez stars as a Chicago policewoman. She's a detective involved in investigations of a murder and whose life is threatened but saved by a strange character, called Catch, played by Jim Caviezel (Thin Red Line, Frequency, Count of Monte Cristo). It emerges that Catch has blotted out his memory of the death of his wife. He has a psychic sense and acts as a kind of guardian angel for Sharon (Jennifer Lopez). In their encounters, she is transformed, especially in the bitterness she has towards her stepfather who was guilty of physical abuse when she was young. She comes to a new life and, of course, helps Catch in his recovery of his memory. A variation on the police and psychological thriller. 1. The initial impact of a police thriller and police investigations? The accident? Sharon at work, protected by Catch? The transition from police action into romance? 2. The Chicago settings, the streets, the homes, the churches? An authentic atmosphere for this story? The musical score, the range of songs, especially commenting on the action? 3. The title, the final song, the reference to Sharon and Catch? 4. The plausibility of the plot: Sharon and her police work, the accident, her restoring Stephen to life, his psychological blocks, doing good? The encounter with Sharon, saving her life? The growing friendship, ups and downs, falling in love? Each having to face their past? The romantic resolution? 5. The glimpse of police work, the dangers in the streets, the criminals, violence? The police squad? At the station, relaxing with drinks, police talk and friendship? Flirtation? 6. Sharon and her trying to keep the accident victim alive? Getting him to look at her? Angel and saving eyes? The passing of the year, seeing her at work, the invitation to her parents' renewal of their marriage vows? The clashes with her brother? Friendship with her sister-in-law and nephew? The discussions with her mother, the truth about her having her father arrested for his violence? His resentment? Her not wanting to go to the ceremony, her finally deciding to go, in the church, at home, following her father upstairs, her brother intervening? Her father disowning her? Her talking to the video camera, recalling when she was playing alien invaders with her brother, the happy moments with her father? The potential for reconciliation - everybody listening, yet her father walking up the stairs seeming to reject her? 7. Catch and his wandering around the city, turning off the car lights and being abused, telling his neighbours that the keys were in the door? His silence, reserve? His lonely unfurnished apartment? His friendship with the little boy - a catalyst for remembering his own? His seeing Sharon in the restaurant, seeing the shootout, pursuing the criminal and saving Sharon? The beginning of the friendship, his reticence, going to her house, attracted towards her, inquisitive, not knowing what to say? The phone calls, the broken appointment and his anger? His going to her house, telling her off? Yet the love, going out, his playing the trumpet and "Nature Boy"? The reaction of his fellow trumpeter and the puzzle? 8. Sharon and the effect of being shot, on edge, attracted to Catch, not being able to discover any truth? The incident with the trumpet? The computer investigation, discovering the truth? Going to his home? Taking him to the cemetery and his violent reaction? 9. Her going to visit Nora, Catch and his bringing the groceries to her, their discussion about the family, blocking out of memories, building a wall? Nora and her advising patients, leaving Catch to change in his own time? Sharon realising she was pressuring him? 10. Her inviting him to the ceremony, his going to the cemetery, his courage, his long talk to his dead wife and son, remembering the day of the accident in detail, the accident itself? His going to meet Sharon, their driving off together, both willing to face memories? 11. The psychological aspect of memories, blocking them out, having to face them for wholeness? The possibility of love and patience breaking through?